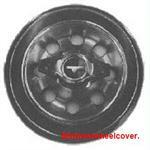 53062, Hubcap used, 15", 99-01, NISSAN, QUEST, SPARKLE SILVER, RAISED LOGO IN CENTER , 9 HOLES, PLASTIC CLIPS & WIRE RING. 62307, Used Rims, 15X5-1/2, 5 LUG 4-1/2", 93-02, MERC, NISSAN, QUEST, VILLAGER. 9 HOLE, STEEL RIM. 62307, Used Rims, 15X5-1/2, 5 LUG 4-1/2", 93-02, MERC, NISSAN, QUEST, VILLAGER. 9 HOLE STEEL RIM.